Artist Separation – uh, Wrong Question! Artist Separation – uh Wrong Question! Horrors! That will cause tune out. Not! The truth is you should push like artists apart. Spread them throughout your schedule. And if you have lesser non core/ non star artists yes they should be much further apart. One tool in MusicMaster I love is the artist separation analysis. Look at this screen shot. 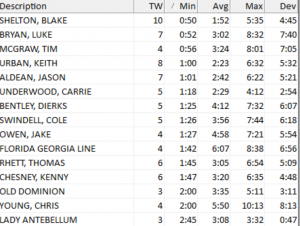 Yes there are 10 Blake Shelton’s on the day and once they were just 50 minutes apart. However on average those 10 songs are 1:52 minutes apart. The average listener has to listen 1:52 minutes to hear a Blake Shelton this on day this station. Now, those 4 Tim McGraw’s … I might find that instance of 56 minutes separation and juggle it a little further apart. I teach my music programmers that in these reports there is a “zone of improvement.” The things that I can see that do call for some touch up when the engine of the music scheduling software has done its paint by number. And that “paint by number” is all done with the settings that I have given it. Take for example this Classic Hits station where there #1 Core artist is the Eagles. There are 11 plays of Eagles records on this station in one day. Once 1:42 apart. The longest without an Eagles is 2:36 minutes. That happens overnight between sometime in the 1 am hour and the 4am hour. Otherwise its steady Eagles about every 2 hours. 2:03 on average. Good thing. I told this PD if I could go more than a single hour 5a to midnight without a play of the Eagles I knew he hadn’t check the log. He has. It’s this care in making sure your core artists are there at regular intervals that help build tsl / atse. In some formats you want artist every hour. I have a country station in a competitive battle in the south where our top 5 core artists (Kenny Chesney, Jason Aldean, Blake Shelton, Keith Urban, Luke Bryan) need to be represented every hour as often as we can. What’s the right artist separation on your station? Wrong question! The question is what’s the right artist density on your key core superstar artists? The Mt. Rushmore faces of your station and format. They need to be there.